It comes to this. One week of desperately trying to avoid a heart attack and knowing it's a losing proposition. After all, it's been six years. How exactly is one supposed to react under these circumstances? I find myself pondering what life in September must be like for fans of teams like the Pirates, who haven't won diddly squat (or even bothered to post a winning record) in 18 years. Football season. That's what it feels like. Not here. The Niners are garbage. The Raiders are... the Raiders. The A's are playing out the string. And the W's and Sharks have yet to begin their respective marches toward inevitable heartache, regret, and mediocrity. (Just sayin'.) Yes, your San Francisco Giants have a unique opportunity to usurp the collective sports consciousness of the Bay Area for the next five weeks. The last team from these environs to play in their league's postseason was the Warriors. I know. Scary, right? It's been one sad state of affairs for jock junkies in this neck of the woods, and it's a shame. After all, we have everything else going for us: culture, diversity, climate, politics — why not a successful sports franchise, or hell, just one bloody season in the sun. That's all we ask. For Giants fans, it's the ultimate existential question: If our team can finally find a way to overcome the Ides of October and end up hoisting the cool trophy with all the pennants on it, will we be satisfied? Will we walk away into the sunset, never again to set foot in a major league baseball park, our wildest dreams fulfilled, ready to experience what life has to offer beyond the chalk lines and $8 brats? Will our family get to see us again at birthdays and holidays and graduations? Will our friends be able to discuss subjects with us that don't revolve around the designated hitter or the infield fly rule? Will we stop wearing our beat-down ball caps to weddings and high-fiving fellow fans at political fundraisers? Will we ever, truly, be sane? The answer, of course, is "No." Because we can never get enough, you see? One championship feeds the hunger for another. Take Red Sox fans as an example. Two championships in three years, and they're still the bitterest, saddest, most depressingly paranoid body of people on this planet — and anyone who came to the interleague series at the Cove in June knows exactly what I'm talking about. That's us, people. Two or three years removed from that mythical Giants championship, we'll be just the same: mumbling to ourselves about what could have been, should have been, would have been. If only... if only... But for that one October, it truly would be magic inside. Of course, this year, the World Series is scheduled to stretch into November, unless somebody sweeps. But you get the point. Don't you? Chad Billingsley is not related to Barbara Billingsley, so far as I know, but Mrs. Cleaver's namesake certainly knows how to make mincemeat out of los Gigantes. Looking at it objectively, our boys got one-hit tonight, and they were lucky the hit came with two runners in scoring position, or they may have been shut out too. Another Friday night, another wasted Padres loss. We simply can't expect the Fathers to continue to deteriorate. We need to win some games in big chunks. Now is the time, if there ever were one. Would've been nice to start the roadie off with a W, but every now and again, each of us runs into our own personal Chad Billingsleys. For some of us, it's the DMV, for others, the IRS, and for some unlucky souls, it's a local parking attendant. 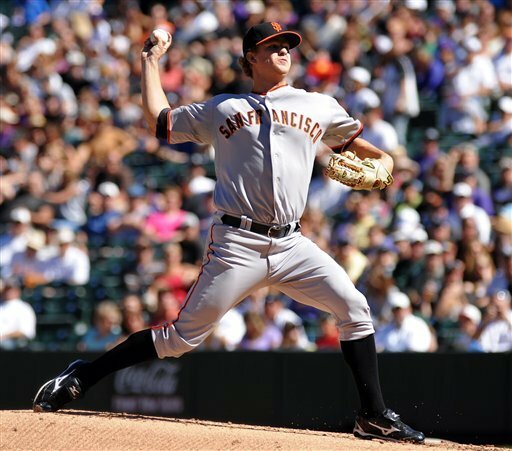 For the Giants pitching staff, it's Rod Barajas. But the secret to success does not consist of regret. It requires a short memory, a stout spirit, and a hang loose attitude. I've said it before, and I'll say it again: this team has all of that in spades. And since I know that — win or lose — they have the heart of a champion, I believe the boys will rebound tonight and lay waste to Los Angeles, particularly Casey Blake, who is quite the douche bag. They better, 'cause I'm cutting my band rehearsal short to make it home in time for first pitch. > Jose Guillen. Yikes. Dude got screwed on a called third strike that was, well, not a strike. But he may have been thinking about what could've been a shoestring catch on Billingsley's two-out, two-strike, two-run single in the 4th. Bottom line: even if Zito gets out of that inning — which he probably didn't deserve to do — the offense still had to get another run, and they looked woefully incapable of delivering. Carlos Gonzales broke his bat after hitting a ball fairly square on a good part of the wood — he said himself after the game he was surprised the bat broke. Consequently, Cody Ross broke in — justifiably — before adjusting and in the end coming up short. Do I think Nasty Nate would have made the same gut read on the ball? Yes. Do I think he has better closing speed than Cody Ross? Maybe. Do I think he would have caught the ball? No. 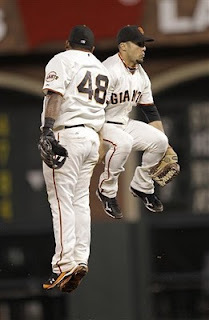 Of course, Freddy Sanchez compounded the weirdness by triple-hopping a throw that, had it not been right on line to Pablo Sandoval, would not have hit Gonzales in the arm and flown into the stands. But it was on line, just low. Game over. These things happen. As my buddy Alex opined on his Twitter thingie: "It would be super if Freddy Sanchez could figure out how to hit and field at the same time." I'll take the hits any day, and especially on a day when we only give Dirty one run of support. What a workout. You know, the local media seems to be picking up this narrative of the Giants as a team that lacks an identity. Personally, I think they're all on crack, and this game is a bright shining example as to why. 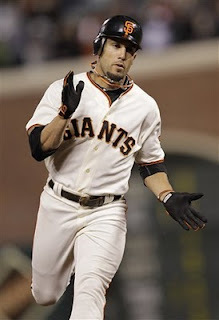 The 2010 Gigantes are the Teflon Team. They're as resilient as Silly Putty. If the 2010 Giants were an ice cream flavor, they would most certainly be Rocky Road, but the good kind, with just enough marshmallows to make you crave another bite. Three cheers for Darren Ford! And cheers to Alex Pavlovic, one of the unsung heroes of the Giants beat, for his work in relief of Señor Extra Baggs. Check out his notes on Darren's debut. Am I trippin', or was that kid playing in San José last year? Wait... oh, right. Critical win for the team. Existential victory for Big Time Timmy Jim. And a sleepless night's worth of "What if's" for one Ubaldo Jimenez. Seriously, if that kid don't win the Cy this year, there ain't no justice in baseball. Meaning he probably won't. And me? I had to watch it all transpire on my iPhone. It's a cross I have to bear for being "engaged": MFTs* of events, networking, drinking, more networking, and occasionally getting things done that can, you know, help people. Oh snap, now I'm bitching. Back to the rawhide, shall we? > I freaking love Andres Torres, not in a man crush kinduva way, more like I want to buy him a case of whatever liquor he fancies. Dude is ripping it up out of the clear blue sky, both for my real team, and my fantasy team. I'd nominate him for Comeback Player of the Year, but he never really got a shot in the first place. Listen to me now: Take your kid to the park. Point out Andres Torres. Make sure they watch him the whole game. That's how you play this game — like there's a fire in your soul and ice in your veins. > Speaking of #TeamHopeyChangey, we were well represented by los Gigantes in this series. Both Dirty and Timmy turned in fine performances above and beyond recently-lowered expectations, and A.T. went nuts at the plate and in the field. We're not exactly shaking up the standings, but we're steadily making a push for the money. Fingers crossed. > Yeah, I know. We could "What if" ourselves to death. I think I said that, or maybe it was some other jackass blogger. Anyway... The Padres have lost seven straight games. Bolly for us. We've managed to claw back within 3 games of the West lead. Again, bolly for us. Could the G's have done a better job of dispatching the Reds last Wednesday and the D-backs over the weekend? Maybe so, maybe not. They're both lighting up all comers right now. All I'm sayin' is if our boys had TCOB, we'd be a lot closer to the promised land, and 3 games is a serious gap with 28 to play.